This Operating Margin Excel Template is a helpful tool to calculate Operating Margin, this will be done using a simplified version of the income statement, which only contains the necessary elements for the operating margin calculation. What is the formula for Operating margin? 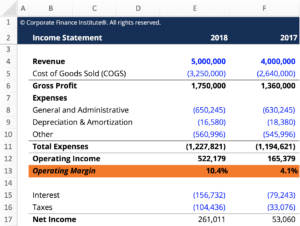 The Operating Margin Template will be a great tool to visualize, how changing different elements of the income statement will affect the final value of the operating margin.